We arrived into Delhi 2.30am and was greeted by our driver Shaid, who drove us to Taj Mahal for our sunrise tour. Our car was comfortable and clean for the both of us and we felt safe on this trip. We had an awesome guide Farid, who was very friendly and readily took pictures for us and he was very passionate about sharing about the Taj Mahal's history. He was well-versed in the history of this exceptional monument and took care of us throughout, making sure we were not lost or caught up in the crowds. He also had great knowledge of Agra Fort which we visited and had lots of little stories to tell which were very interesting. It was a headache looking through trying to decide which agency to go with, but I'm glad I went with this one. The drive back to Delhi was also hassle free and safe. Driver Shaid didn't intrude our rest and was kind and respectful. All in all, GREAT TOUR. Taj Mahal at Sunrise is Amazing and even made better with good guide and driver. 5 starts...driver was on time to pick us up from our hotel in New Delhi and take us to the Taj Mahal for sunrise...we met our tour guide Ashish there where he gave us an awesome 'insider' tour of the Taj...he knew all the best spots for the coolest pictures and gave us the great history behind this magnificent and iconic place. Ashish went above and beyond and took us to a few places to buy some nice souvenirs and helped us meet our other driver. Great experience, great price, highly recommended! My wife and I live in Miami USA and were fortunate to be invited to an Indian wedding in Pune, India in July-2018. We were scheduled to arrive from Miami USA into New Delhi, India at 2:00 a.m. and had 17 hours before catching the flight to Pune for the wedding. We were told by many people that a visit to India is NOT complete without a visit to the 1 Wonder of the World, the Taj Mahal. Since we were only a 3-hour car ride from Agra, we decided to book a 1 day tour to Agra to visit the Taj Mahal. After extensive research in Tripadvisor and Viator, we decided to book our 1 day tour with Perfect Agra Tours. Soon after we booked via Viator, we were contacted by Mr. Ashish Gupta owner who was very professional and very courteous. He ensured to have a private driver and a private guide ready for our 1 day trip. When we arrived into New Delhi and cleared customs and immigration by 3:00 a.m., the driver Mr. Ajay was patiently waiting for us outside the airport gate. Mr. Ajay then drove us for 3 hours to Agra. He had water bottles for us and was very friendly and very courteous. The car was very comfortable with air conditioning. When we arrived into Agra around 6:30 a.m., we were greeted by Mr. Farid our personal tour guide. Mr. Farid accompanied us to the Taj Majal while the driver Mr. Ajay stayed with the car and with ALL our luggage!! This was the perfect time of the day to visit because we could view glorious and majestic Taj Mahal during the early sunrise and before the crowds of visitors arrived. The guide Mr. Farid spoke excellent English and took us into the extensive grounds of the Taj Majal. Mr. Farid explained to us the full history of the Taj Majal. He made us pose at the best view points to take photos us with our cameras.the perfect tour guide!! He always had bottled water for us. After a couple of hours at the Taj Mahal, we were taken by Messrs. Ajay and Farid to visit Agra Fort and the Baby Taj Majal. Then we were taken to local shop to purchase souvenirs and the famous Indian pashminas for my wife. To finalize the day trip, Mr. Farid took us to have lunch at one of the best restaurants in Agra.Pinch of Spice. The food and service was excellent!! Mr. Farid made sure we were properly seated and properly served. After lunch, our driver Mr. Ajay drove us back to New Delhi in time to catch our flight to Pune. After this wonderful experience, my wife and I are VERY grateful for the professional and courteous attitude and warm feeling we received from Mr. Ajay and Mr. Farid. They are wonderful human beings who made us feel welcome and safe in India. 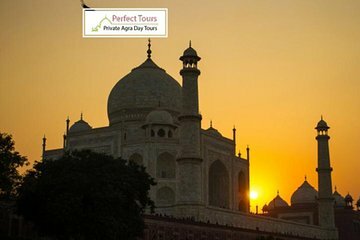 We recommend Perfect Agra Tours and congratulate them for hiring such excellent individuals like Messrs. Ajay and Farid. I recommend the sunrise tour during summer because it can be really hot during the day. My tour guide was Farid. He is very kind and knowledgeable. He helped me took some great pictures and told me the histories of Taj Mahal, Baby Taj and Agra Fort. My driver was great as well. I really enjoyed this tour. It was my first trip to India. The first opportunity to see the Tajmahal was so mesmerizing that I fell in love with this country. Its beauty was outwordly. The sunrise day tour was something totally out of the box which I can't imagine even, though I read a lot about this world famous monument. I was out of words to describe the beautiful place and my guide Mr. Ashish Gupta was a very good person. He was very friendly and after meeting him I was highly impressed with his knowledge about the monument. The services given by his company were very prompt. I would like to visit Tajmahal again and again whenever I could visit this place.